As a mom, one of my biggest hopes for my kids is that they would grow up proud of who they are, how they are wired, and the masterpieces God created them to be. My boys are gifts that made me a mom, stretched me more than I knew possible, and helped grow me into the mom I am today. I will be forever thankful I got introduced into motherhood with them. When I found out our third was a girl, I was so excited but also….scared to pieces. It is no secret that girls can be picked apart and critiqued everyday. Sometimes a girls worse critic can be herself. Every comment about her hair, size, color, attitude, likes/dislikes has the power to uplift and build up confidence or tear her completely down. If I can succeed at anything as a mom to a little girl, I pray that I help her to be confident and convinced in the masterpiece she is. I want so badly for her to grow up knowing she is a unique creation and to and treat herself like she believes it. What some may not know about my relationship with my little Reagan Noel is that our biggest fights are about her hair. She hates for is to get styled, washed, brushed, braided, played with, and put in a pony tail. In summary, she really just doesn’t want her hair touched. She has the most beautiful curly hair. I just adore it, yet it requires care like anything else so that always puts friction between us. Curly hair gets tangled. The only way I can brush Reagan’s hair is if it gets washed and I comb it while it is wet. Even then, it is still a battle. I don’t wash her hair everyday. So when we do wash and brush it, you can only imagine the cries of my dramatic, sweet four-year old. I am continually trying new brushes, products, and techniques to make this little task easier. I was so excited when I was selected to try Dove’s new curly hair products in their “Love Your Curls” campaign. If you have a four-year old girl (your experience may be like mine), they like to dress themselves, already have an opinion and taste in clothes, and a little lip gloss will bring them much joy. Reagan is a free spirit when it comes to her style and for the most part I don’t fight it. I let her choose outfits and often times bite my lip when she walks out the door. When it came to her hair though, I’ve always just taken control. This may be because she is four or may be because for the sake of time it is one thing I can do “quickly”. It has been such an unpleasant experience, why drag it out for longer than it needs to be? I compliment and praise my daughter for her curly hair often, but here was an opportunity to teach her about her hair and build some confidence in the process. We started with a hair cut. It was hard for her to let her Rapunzel hair goal go, but we cut off eight inches and it is still long. We then tried Dove’s shampoo and conditioner. I let her rub some in her hair, I did as well. 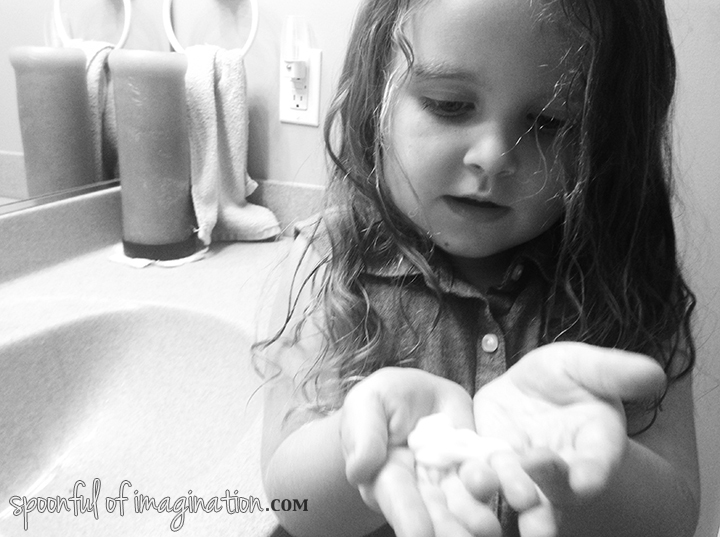 There were minimal tears letting her assist with the wash and rinse! 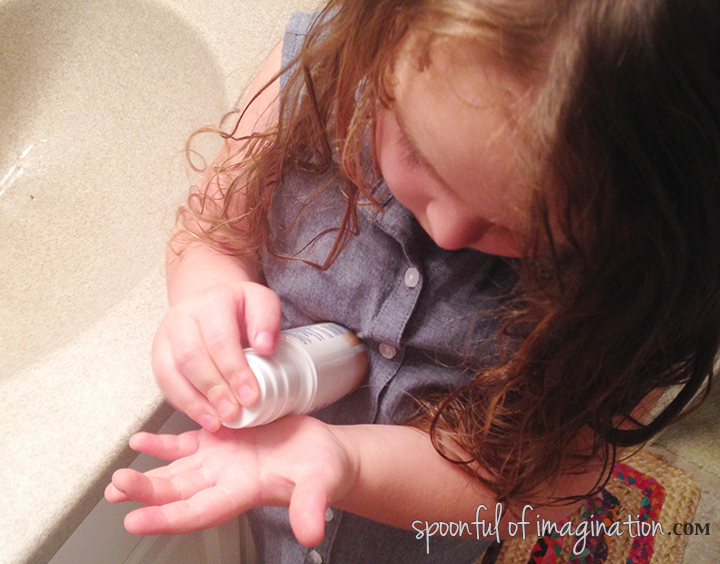 I found the shampoo and conditioner left her hair feeling soft and smooth and more manageable! Next, we tried some of the new Dove styling products. We loved the Quench Absolute Supreme Creme Serum. It is Dove’s first curl leave in nourishing treatment. It’s fast absorbing, lightweight and can be used on wet or dry hair. I let Reagan’s hair be about half air-dried when I apply it. I love how you can’t even tell she has a product in her hair. There is no hardness to her curls. They are still lightweight but just a little less frizzy. When we were done doing her hair, she was smiling so proud. Here I had not just complimented her hair, I let her take some ownership in helping to care for her hair. By taking the time to turn an unpleasant task into a teachable moment, my daughter grew a little pride. I wonder how many special moments I miss by rushing to get through the task at hand. We have not used these products for very long, but I am pretty sure I am a huge fan. Did you know that one in three women in the US have curly hair? 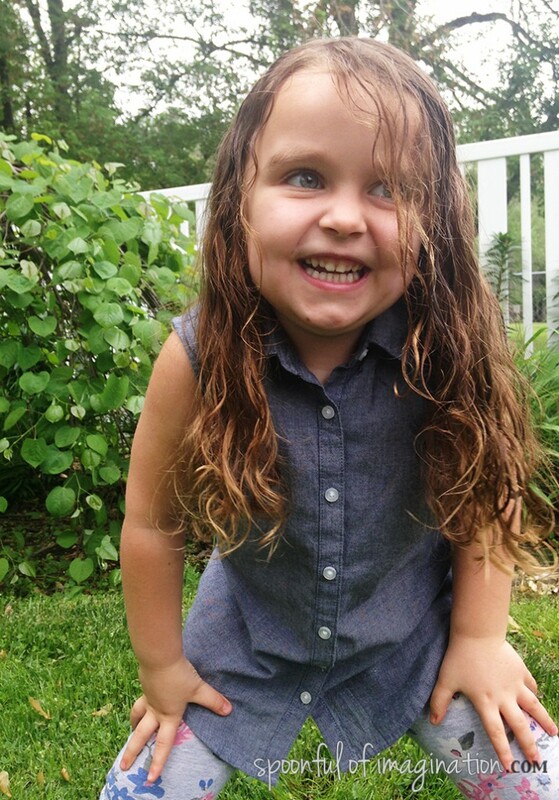 Did you know that only 4 in 10 little girls with curly hair think their hair is beautiful? 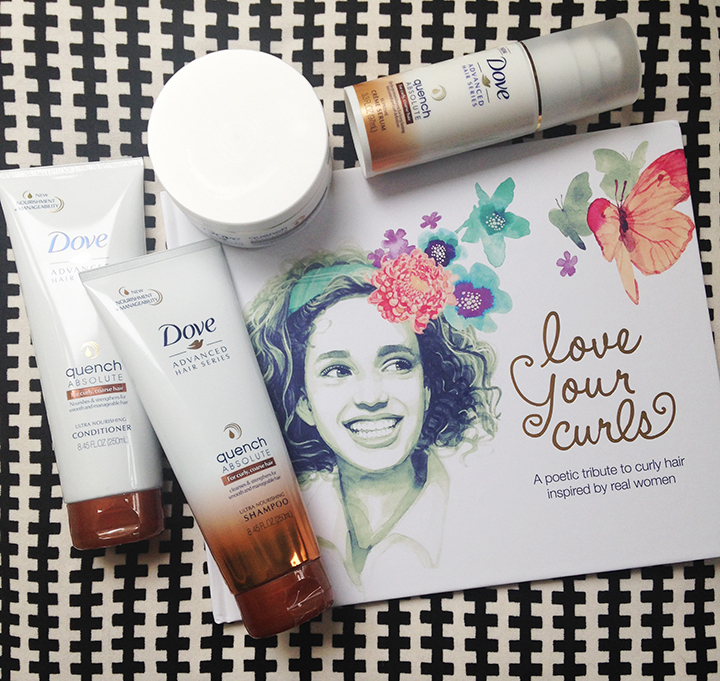 Dove wants all women and girls to love their curly hair. The “Love Your Curls” campaign was created to encourage women to celebrate their curls and inspire future generations to do the same. I believe the more we celebrate how we are and people around us do the same, girls will more likely feel beautiful and be proud of their unique characteristics. 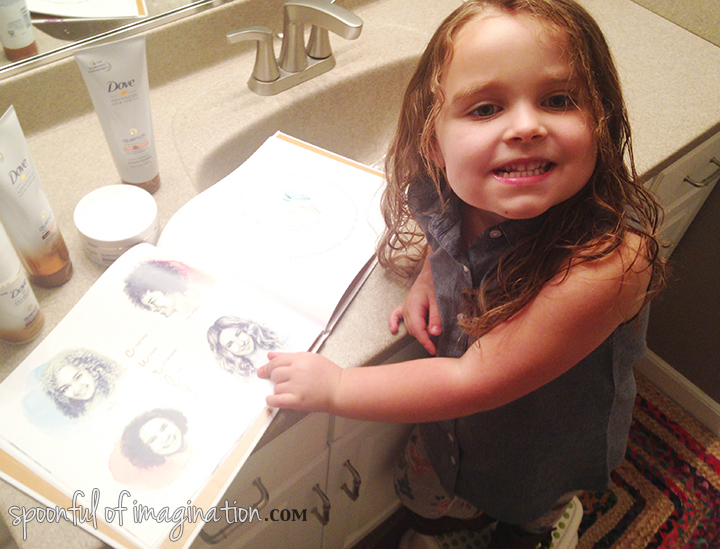 The NEW Love Your Curls book is a poetic tribute to curly hair. It is intended to represent and inspire curly-haired girls of all ages. If you would like to get a copy of the book to read to your little girl, you can download a free e-book here. You can also personalize it and create a customize dedication to your little girl. Reagan absolutely loved the book and seeing girls that had hair just like her. 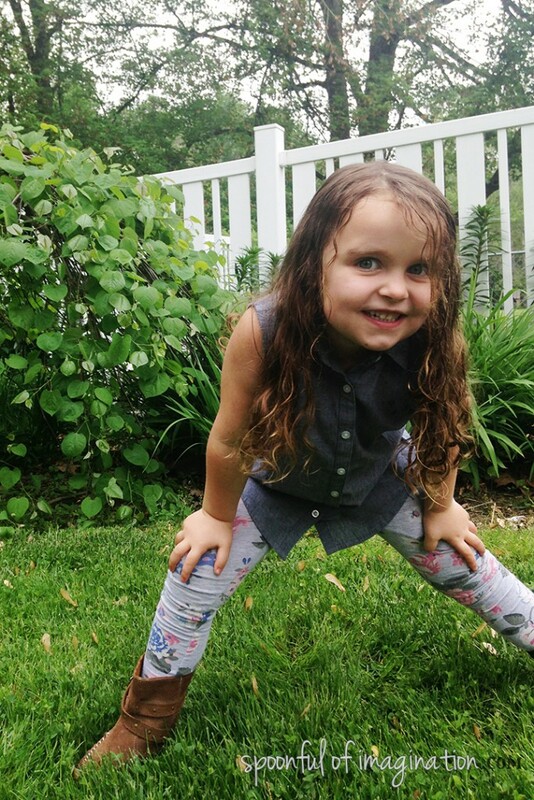 My Reagan is sassy, spirited, full of life, and so fun just like her curly hair. I pray she grows up loving her hair and being proud of how she was created.